February 28, 2011  A ball-cap-wearing lawyer, a balding oil executive and an air force pilot who "couldn't bomb my own people" — these three have emerged as lead characters in the rebellion that took over Benghazi, Libya's second-largest city. February 28, 2011  Sirte, a small town on Libya's Mediterranean coast, remains in the hands of pro-Gadhafi forces, and rebel commanders say it has assumed strategic importance. 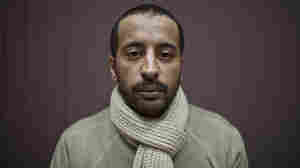 One man says he and other prisoners were tortured by pro-Gadhafi security forces there before he was able to escape. February 27, 2011  A massive exodus of foreigners from Libya is taking place. This weekend in Benghazi, ferry boats from Tunisia came to pick up North African nationals and take them out of Libya. But left behind were Africans and Asians, who begged for someone to help evacuate them. February 25, 2011  In the second largest Libyan city of Benghazi, a massive protest is planned after Friday prayers as a message to Moammar Gadhafi. All of eastern Libya is under the control of the rebels, and the people there say they will never submit to Gadhafi's rule again. February 24, 2011  Libyan army troops who have defected to join the pro-democracy rebels are trying to organize an offensive against the regime, according to senior military commanders in Benghazi, the birthplace of the uprising. What's unclear is how unified the fractured military command is. February 24, 2011  Libyan leader Moammar Gadhafi's control is being whittled away as major cities and towns closer to the capital fall to the rebellion. 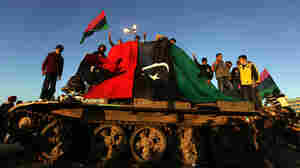 Forces in the east, led by a former Gadhafi general, are preparing to march on Tripoli. February 23, 2011  In the eastern Libyan city of Bayda, a new government is being formed. 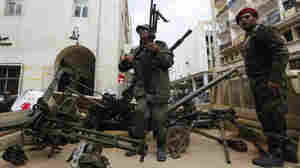 As forces loyal to Libyan President Moammar Gadhafi reportedly held on to control of the capital city of Tripoli, the eastern part of the country is in the hands of the rebels, who are now trying to organize themselves. February 21, 2011  Egyptian officials say the country's border with Libya is no longer manned by Libyan troops. The Egyptian army is regulating the flow between the two countries. Several aid convoys carrying medical supplies are traveling to the border to help Libyans in the east. February 20, 2011  Some reports from Libya say that violence between police and protesters has left more than 200 people dead and many more injured. In the Egyptian capital, Cairo, a small group gathered outside the Libyan Embassy in solidarity with the demonstrators. February 18, 2011  It's been one week since the ouster of Hosni Mubarak, and huge crowds converged again Friday on Tahrir Square in Cairo. The official Egyptian news agency put the turnout at more than 2 million. Demonstrators are complaining that the military has stopped meeting with youth groups, and that there have been no pay raises in years. February 17, 2011  While mob violence like the attack on CBS' Lara Logan is not the norm, sexual harassment in Cairo is an everyday occurrence — and most women have their own personal stories to tell. But Egyptian women hope the revolution will change all that. February 16, 2011  New divisions are emerging both within and among the youth movements that fought to topple Hosni Mubarak. While the military remains firmly in charge, the groups that participated in the revolution have a new challenge to find a central leadership.